My husband Justin Cook and I were hired to shoot an epic beach vacation in the OBX this summer. 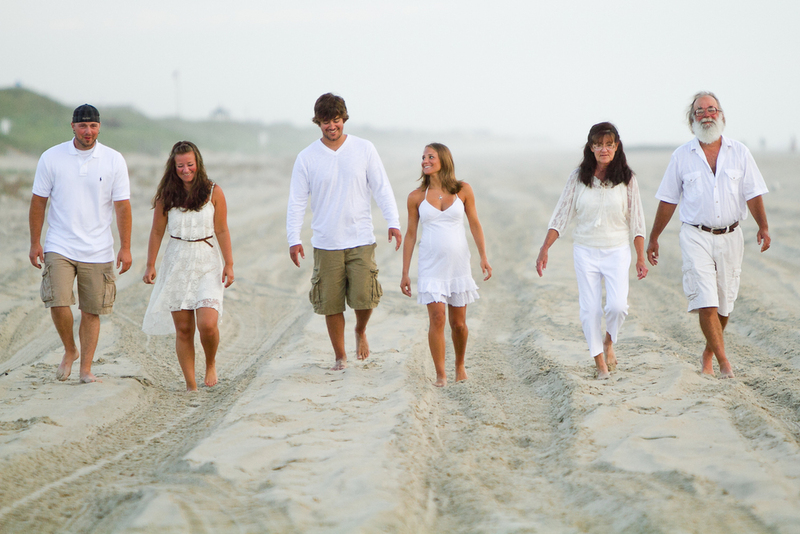 The Burnor family stays there every summer in a large beach rental, along with some of their closest friends and extended family. It's a family tradition that Justin and I were SO excited to be a part of and document for them, especially since 2 of the families were expecting and things were about to radically change for this group. Justin and I woke up an hour before sunrise to get ready for this beach shoot the day of. We split everyone up, and I called dibs on the preggo couples, naturally. :) First I shot with the adorable Cole and Krysti, who were expecting their first child in a few months. We walked along sandy trails and climbed on small dunes before the heat of the day. Next I shot with Nick and Tina, whose second child was due soon too. Because the sun was just rising over the ocean, we took a lot of photos at the edge of the water where the light was magical. Their adorable toddler joined in on the fun, and family members even photo-bombed our shoot with a surprising prop- see below! Cole, Krysti, Nick, and Tina- thank you so much for giving me the opportunity to shoot your maternity sessions! Now that your kiddos are finally here, I hope to shoot with you again in the near future since your family has expanded. Justin and I had a blast working with you and hanging out with your crazy awesome family in the house. We can't wait until next time!